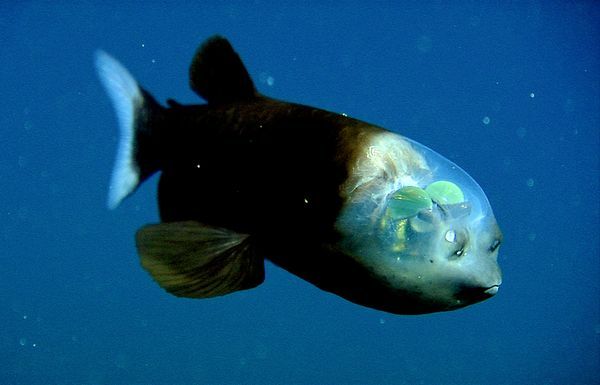 The Pacific barreleye fish has a see-through head! This deep-sea creature’s bright green, tube-shaped eyes are good for taking in light — and finding prey — as it swims through dark ocean waters. Its eyes move inside a clear membrane that’s filled with fluid and covers the fish’s head like a shield. Barreleyes were first described in 1939, and for a long time marine biologists thought their eyes couldn’t move. How the fish survived was a mystery, because life would be pretty tough if you could never see where you were going or what was in front of you! (Capturing prey would be a challenge, too.) But in 2009, researchers Bruce Robison and Kim Reisenbichler of California’s Monterey Bay Aquarium Research Institute announced their discovery that the fish can rotate their eyes forward as well. How did they learn that? Modern technology. Most knowledge of the barreleye came from specimens caught in nets, but their membranes were destroyed. Robison and Reisenbichler studied barreleyes in their natural habitat, thanks to the underwater cameras on the aquarium’s remotely operated vehicles (aka ROVs). They took videos of the fish at depths of up to a half-mile below the ocean off the central California coast, and described the transparent head for the first time. They even managed to capture a barreleye with its membrane intact and study it for several hours in a shipboard aquarium. The barreleye has large, flat fins that help it stay almost completely still in the water, then move through it very precisely. Robison and Reisenbichler think the fish spends a lot of time hanging out in the depths, looking upward until it spots potential prey, possibly small creatures caught in the stinging tentacles of sprawling jellyfish known as siphonophores. The membrane would protect the barreleye from the jellyfish stingers as it snatched away its meal.